Just finished two rounds of golf today (Sunday). An "All You can Golf" day for $25 at a nearby golf course has given me so much excitement and disappointment, so much fun and frustration, and so much joyfulness and soreness. Absolutely love this game! You have to be in focus in every single shot. You have only one chance to hit each shot. Clear your mind, relax and feel your body movement, try to duplicate what you have learned from driving range practice, but do not over-think;. swing and hit with a rhythm, and when you hear a sharp and crisp metal sound, your chance of having a pretty good shot is high. But the problem is, I cannot clear my mind and relax that easily, and I cannot hear that nice metal sound all the time. But yet, you learn from your game. When you screw up a shot, it's not the end of the world. You leave your disappointment behind, focusing on the present, try your best to recover. Knowing how to recover from bad situation is just as important. 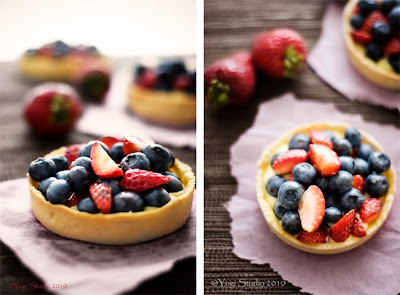 At the end of the rainy day, my hair was all messy and my pants were soaking wet, I met some nice people on the course and I spent some good times with N.
These fresh berry tarts are wonderful embellishments for a great day. You can use any of your favorite combination of fresh berries or fruit. My first choice is blueberries and raspberries. Their sweetness complement each other really well and they look gorgeous together. But raspberries were nowhere to be found yesterday, so I substituted with strawberries. This combination is also delicious. The recipe is coming from the cookbook Tartine , a birthday gift from my sister-in-law a few years ago. I put it aside for the longest time until last Christmas, I made chocolate cookies out from this book, and they were out of this world. From then on, I was hook on the book. Not only are the details of the recipes worth reading, the kitchen notes are especially useful because those are tips from a bakery. To supplement all these, the pictures are gorgeous that I never get tired of looking at them again and again. I specially like the easy-to-handle tart dough and the light but delicious pastry cream of this recipe. I will share the simplified version of the recipe below. Please get the book for the full version. Using a stand mixer fitted with paddle attachment, beat the butter, sugar and salt at medium speed until smooth. Add eggs. One at a time. Mix until smooth before adding another. Scrape the side of the bowl occasionally. Add flour all at once and mix at low speed until just incorporated. On a lightly floured surface, pour out the dough. Divide the dough into four equal portions. Shape each portion into a ball and then into a disk about 1/2" thick. Wrap each disk with plastic wrap and chill for at least 2 hours or overnight. On a lightly floured surface, roll the dough out into 1/8" thick and cut out pieces of 1" to 2" bigger than your tart pan or tart rings. Transfer the dough to the tart pan and apply slight pressure to the bottom and side of the pan. Put the pastry shell in the fridge and chill for 15 minutes or until firm. Dock bottom of the tart shell with a fork, making holes around 2" apart. If using 31/2" tart rings, bake for 10 mins. Mix egg wash ingredients. Take out the tart shell and brush the bottom and side lightly with egg wash. According to the book, this can seal the bottom and the side of the tart shell to avoid the tart shell to get soggy that easily. Put the tart shell back to the oven and bake for another 20mins, or until lightly browned. The baking time I posted here is based on my personal experience. For some reason, the baking time suggested in the book is a lot shorter. If you are trying the recipe for the first time, please watch out for your time. It may vary depends on the size of your tart pan. As mentioned in the book, this dough is very forgiving. You can gather scarp pieces and roll it out many times and the dough is still good. You can also freeze the unused dough. Place a fine-mesh sieve on top of a bowl. Put it aside. Whisk together cornstarch and sugar. Add eggs and whisk until smooth. Add milk to saucepan. Scrape beans out of vanilla bean pod and add to milk. Add salt. Cook milk over medium-high heat and bring to just under a boil. Stirring occasionally to avoid milk solid sticking to the bottom of the pan. Remove from heat. Slowly laddle 1/3 of hot milk to egg mixture, whisking continuously. Pour the egg-milk mixture back to the hot milk in the saucepan. Cook the hot egg-milk mixture over medium heat. whisking continuously, until the custard is as thick as lightly whipped cream, about 2 mins. It is very easy to get over cook at this step. When you can see a few slow bubbles or start hearing bubbling sound coming from the bottom of the pan, it is time to remove the pan from the heat. Immediately pour the hot egg custard through the sieve into the bowl. Let cool for 10 mins. Stirring occasionally to release the heat and prevent a skim from forming. When the pastry cream cool to about 140°F, whisk in the butter, one piece at a time.Whisk until smooth before adding another piece. Cool the cream before using. Put a plastic wrap right on top of the cream to prevent skin forming. Spoon pastry cream into tart shell. 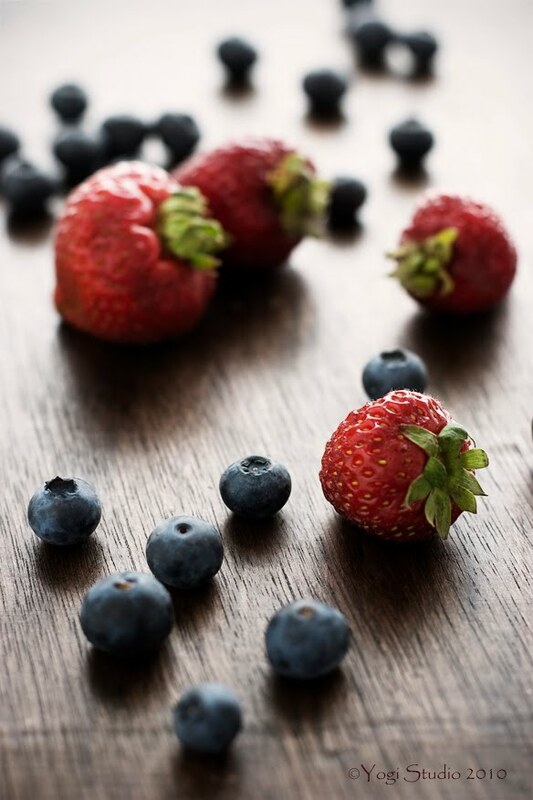 Put your favorite berries on top. If you like, you can brush the fruit with some apricot glaze. To make the glaze, put some apricot jam and little bit of water into a saucepan over medium low heat until the jam dissolved. Strain the jam through a sieve. These photographs are beautiful! Because they're mostly fruit they must be healthy, right? ;-) I love the color combo, perfect for summer. Genny G. - Thank you for dropping by. Y - That chocolate cookie is really quite memorable...hmm...make me want to make some now! Ari - Thank you. I would say...they are pretty healthy...just don't keep eating the tart shell!" Gorgeous! I have not tried this recipe yet, but fruit tarts are one of my all time favorite summer desserts. 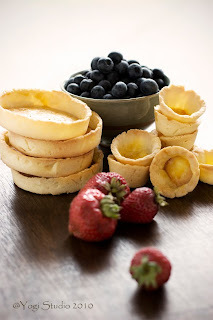 I love that you can substitute different varieties of fruit and replace the pastry cream with curd... I could eat them every night! Your minis are adorable! Paige - You're right. Fruit tarts are versatile, you can put in fruit that you like, with different fillings, and make into any shape and size you like. I love those little bite sizes alot. Easy to eat and got more crust! chocolatecup - Yes, these are perfect afternoon snack with tea! Glad you like them! Juliana - Thank you. I like the mini ones a lot. I couldn't stop eating them! 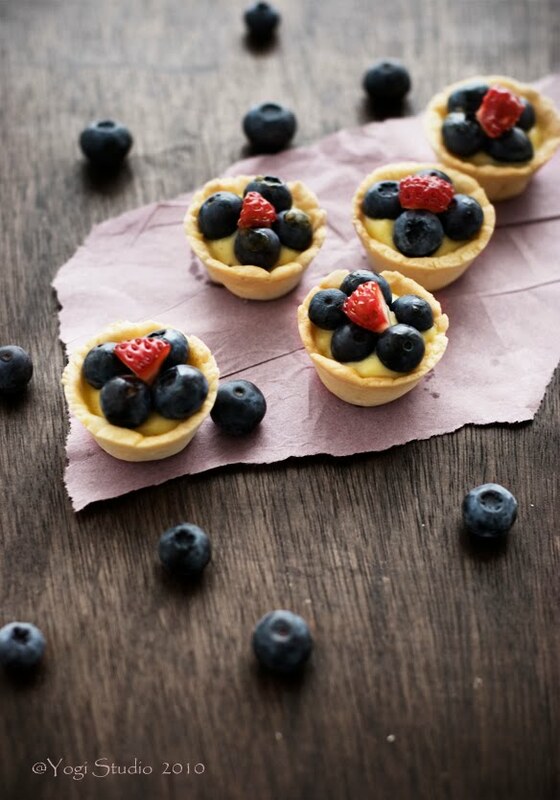 These little tarts are adorable! I also love Tartine - everything from the cookies to the cakes to the breads it's all delicious! Would this recipe make a 9 inch tart? These mini ones look gorgeous! How many mini ones did it make?